The Senate Commerce Committee held an oversight hearing of the Federal Communications Commission on August 16. When he announced the hearing, Committee Chairman John Thune (R-SD) said, “From efforts to better utilize spectrum powering our wireless economy to expanding rural broadband access, combatting robocalls, and reviewing the media landscape, the FCC and its operations are critically important. This hearing will offer Senators the opportunity to ask commissioners questions about topics of critical importance to their states and constituents.” And the Senators did just that. The hearing was slightly less partisan than the House oversight hearing on July 25. (Well, except for when all those relatable politicians started talkin’ football teams. But that's for another post.) While big-picture issues followed traditional partisan and ideological splits, most senators were focused on asking questions that related to policies that had an impact on their constituencies. Still, in light of 24 million Americans lacking broadband, a controversial net neutrality proceeding, and a President unabashedly attacking the press, one was left wondering how much of the hearing was oversight, and how much was overlook. Chairman Thune’s opening statement praised the FCC’s approach to closing the digital divide, saying the FCC has taken action to free up more spectrum for wireless use, streamline broadband deployment, and bridge the digital divide. 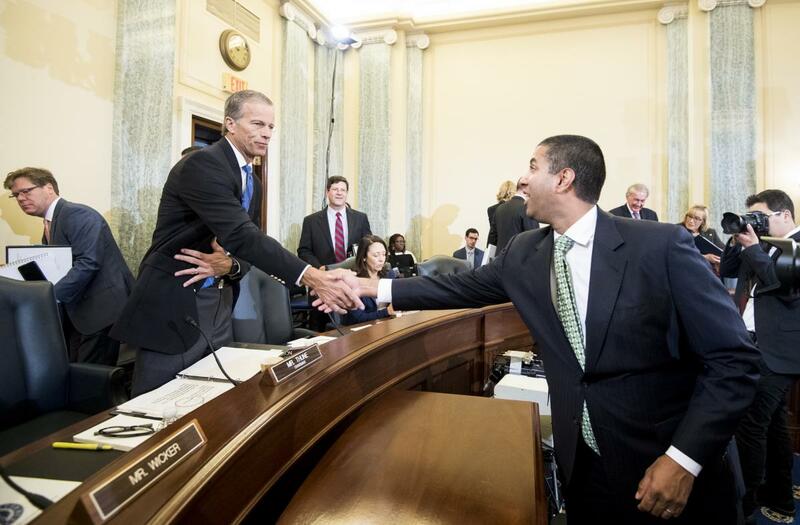 Near the end of his opening statement, Chairman Thune also praised the transparency measures adopted by FCC Chairman Ajit Pai, saying, “I want to acknowledge the unprecedented measures the Commission has taken under Chairman Pai’s leadership to improve the openness and transparency of Commission processes,” while also tying that to the recently-revealed “mistake” by the FCC concerning a distributed denial of service (DDoS) attack that never was. "Publicly releasing drafts of items the FCC plans to vote on weeks prior to doing so has made both the process and products at the FCC better and more available to the American people. The same applies when the Commission makes mistakes," Chairman Thune said. "[I]t is absolutely critical that the information provided to Congress and to the American people be correct." Abdicating the agency’s statutory authority to protect consumers on the internet. Paving the way for unprecedented broadcast consolidation. Proposing to eliminate rules that make quality educational content for kids readily-available on free, over-the-air television. Sen. Nelson said real solutions are needed for quality, affordable, universal broadband. He noted lip service and the repeal of consumer protections. “What we haven’t seen is progress in actually closing the digital divide,” he said. On bringing broadband service to rural areas, Chairman Thune was direct: “Put simply, the Commission needs to act this year to address funding for legacy and model-based high cost support.” Chairman Thune claimed that the uncertainty in funding programs makes it difficult for Internet service providers (ISPs) to plan for deployment, so he asked for a commitment to have certainty by the end of the year, which Chairman Pai agreed to. Chairman Thune also asked about the issue of aligning the different rural broadband funding programs (e.g., the Universal Service Fund, the Department of Agriculture’s Rural Utility Service, and funding from the Department of Commerce's National Telecommunications and Information Administration) to ensure that they avoid overbuilding in areas that are already receiving support. Throughout the hearing, Chairman Pai and fellow Commissioner Michael O’Rielly returned to the issue of overbuilding, implying that the government doesn’t want to have funds go to helping a 4th, 5th, or 6th competitor when there are communities with zero providers. First, we need a new broadband plan. And we need to begin with the end in mind. At the start I mentioned there are 24 million Americans without access to broadband. There are 19 million Americans in rural areas who lack this service. There are 12 million students who fall into the Homework Gap because they do not have the broadband at home they need for nightly school work. Let’s commit now to a plan to ensure that every one of them has access to the high-speed service they need—by 2020. Call it Broadband 2020. One area of bipartisan agreement was concern about the FCC’s maps of wireless and broadband service coverage. Everybody wants accurate maps. Chairman Pai made a point to emphasize that he “inherited a mess” when it came to the maps, but that the FCC is on a corrective course. He noted that the FCC recently adopted an order that would extend by 90 days the period by which carriers and others can file a challenge to the maps (known as the “challenge process order”). He said that he wanted make sure everybody gets full and fair opportunity to participate in the challenge process so that the FCC is operating with accurate data. Commissioner Rosenworcel agreed on the need to improve the maps, but emphasized the need to reach out to more voices in helping solve the problems. “We’ve got to stop pulling this info just from carriers,” she said, and noted the need to crowdsource from the American public. Despite the prepared answers from the FCC, skepticism remained as to whether the coverage map could become truly accurate. “I don’t know if we’ll get an accurate map, even with the challenge process,” said Sen. Roger Wicker (R-MS). Chairman Pai made 5G a central part of his testimony. He touted the numerous spectrum auctions the FCC has implemented or will be conducting in the future, all with the goal of opening up more spectrum for carriers of all kinds. He also emphasized the need to modernize wireless infrastructure rules, i.e., bypassing local regulations in an effort to speed up 5G deployment. But certain senators want to know that, in the race to 5G, those communities currently without access would not be left behind. “As we work to get 5G...what happens to the places who have No-G?" asked Sen. Tester. Chairman Pai assured the committee that, as part of his plan, the FCC would make sure the U.S. would lead the world in 5G. He also reminded the senators of the reforms he has made to the Universal Service Fund, which will "provide up to $2 billion over the next decade to bring fixed broadband to unserved areas in rural America" on top of allowing fixed wireless providers an opportunity to compete for funding. 5G also brought about another point of bipartisan agreement: not to nationalize it. Sen. Ted Cruz (R-TX) asked the commissioners, “Do any of you disagree that nationalizing 5G would be a mistake?” Every commissioner affirmed that they believed nationalizing 5G is not the way forward. Sen. Wicker asked Chairman Pai about the accusation that his FCC is “undermining the Lifeline program.” Pai said this is false, noting that the FCC was changing the focus from wireless carriers to consumers. He reiterated that the goal is to have every American who needs the Lifeline program to get it. Later in the hearing, Sen. Richard Blumenthal (D-CT) asked whether Chairman Pai could commit to ensuring that veterans who are currently receiving the Lifeline subsidy would continue to do so. After a back and forth, Chairman Pai said that he could not commit to something without the FCC getting a full chance to study the record, but that it is his commitment to have the Lifeline program serve everybody who needs it. Sen. Brian Schatz (D-HI) asked Chairman Pai about the DDoS cyberattack the agency claimed it suffered in 2017 when the public experienced difficulties filing online comments in the net neutrality proceeding. An August 3 report by the FCC inspector general found the agency “misrepresented facts and provided misleading responses to Congressional inquiries” when claiming a cyberattack that did not occur. At the hearing, Chairman Pai said that his first reaction to the news of the malfunction was that it was probably linked to the surge in traffic from John Oliver’s show, “Last Week Tonight”. Pai said he had his chief of staff relay that hunch to the FCC’s chief information officer, who responded that he was “99 percent confident” that the breakdown was caused by a malicious attack. Sen. Schatz asked Pai why he didn’t quickly correct the FCC’s public allegation that the malfunction was the result of a cyberattack. “At some point before the IG report came out did it occur to you to communicate back with the public that this may not have been a DDoS attack?” Schatz asked. Pai insisted that he was bound by a request for confidentiality by the inspector general, who had referred the improper claims of a cyberattack to the Justice Department for possible criminal prosecution. The FCC “wanted you to get this information sooner,” Pai said to Sen Schatz, but the inspector general requested that he not comment publicly on the matter while it conducted its investigation. “I made the judgment that we had to adhere to the [inspector general’s] request, even though I knew we would be falsely attacked for having done something inappropriate,” Pai said. “The story in this report vindicated my position." Sen. Schatz acknowledged that Pai was in a “difficult position,” but stressed the importance of accountability and transparency during the contentious debate over net neutrality. “I can’t imagine that there was not another way to thread this needle and deal with us in our oversight capacity,” he said. In her opening remarks, Commissioner Rosenworcel, the sole Democratic commissioner on the panel, criticized the agency’s claims of a cyberattack. “Our claim that the agency suffered a DDoS attack following John Oliver’s report on net neutrality is just not credible,” she said. “And in the meantime, this agency has ignored the fact that this public docket is flooded with fraud,” she added, referring to reports that millions of comments submitted to the FCC were signed with stolen identities. "We were told for many months that this decision would be ‘the end of the Internet as we know it’ — that if this decision passed you would get the Internet one word at a time,” Pai had said earlier in the hearing. “That has proved flatly false. It has been 67 days since the repeal. The Internet is still working." Sen. Cruz joined Chairman Pai’s in a tongue-in-cheek assessment that the sky had not fallen. But Sen. Ed Markey (D-MA) noted that the net neutrality rollback is not completed, and perhaps it is too early to draw certain conclusions. He asked Commissioner Rosenworcel for her insight as to whether or not we would expect broadband providers to start to set up fast and slow lanes knowing the process is not complete. An interesting exchange occurred between Sen. Blumenthal and Chairman Pai concerning interactions between the White House and the FCC in regards to Sinclair’s acquisition of Tribune. Chairman Pai said White House Counsel and Assistant to the President Don McGahn called him directly in mid-July, shortly after Pai announced his decision to propose an order to send the $3.9 billion merger into a lengthy administrative hearing process, widely viewed as a deal-killer. After a back and forth, Sen. Blumenthal requested a written summary of the conversation. It should be noted that the White House phone call does not necessarily require a short letter summarizing the conversation (an "ex parte"). But, if the White House counsel called and urged the FCC to do anything, that would be inappropriate behavior on the part of the White House counsel. If the White House tried to influence the process, the impropriety would be entirely with the White House, not with Chairman Pai. The hearing occurred on the same day that the Boston Globe led a loosely-coordinated, nationwide effort to publish editorials pushing back against President Donald Trump’s attacks on the press. Sen. Maggie Hassan (D-NH) asked each member of the commission for a yes or no answer on whether President Trump’s characterizations of the press (as fake news, enemies of the people, disgusting), is, "harmful to the values enshrined in the First Amendment." Republican Commissioner O’Rielly said he thought the First Amendment and the ability of the press and journalists to respond to the circumstances are stronger than any particular persona’s critique, no matter who they may be. When asked directly by Sen. Hassan as to whether that meant he thought the President’ comments were harmful, he said, “I don’t think it is appropriate for me to comment about the President of the United States in this context.” He went on to say that he did not think the President’s comment was accurate, but would not comment on its potential harm. Republican Commissioner Carr said, “The First Amendment operates as a restraint on the government, that we don't put a thumb on the scale in favor of one speaker or the other. The purpose of the First Amendment is to encourage robust, perhaps rough in some situations, discourse. At the FCC, my job is to act consistent with the First Amendment in every single thing that I do, consistent with the First Amendment rights of the media and journalists." While Senators and policymakers discussed the FCC's approach to closing the digital divide, inaccurate statements to Congress, and the First Amendment, some might wonder how different life may be inside the hearing room and outside of it. Outside we can see the same problems, but perhaps in a more dramatic light: 24 million people without broadband access, a public that has felt unheard and lied to about their historic engagement in the net neutrality proceeding, and a President’s outright hostility to the fourth estate. Indeed, one may also begin to wonder why these decisionmakers do not show more urgency in these matters, or how long they can ignore them. We'll see in you Headlines.